We were down in Philadelphia to swap out the rental, and we wanted to get some sushi. A quick internet search suggested we try out Sushi Planet. It happened to be down near Penn's Landing, so we drove that way and hoped for some parking. We got lucky and saw someone pulling out, so we grabbed their spot and paid at the kiosk. Reasonable rate, although we over-guesstimated how long it would take us (better than to get a ticket, tho!). It was only a couple blocks away, and with the Flyers game on tv, the eateries (and the sidewalks in front of them) were filled with screaming fans. It was Friday night, but we were seated immediately, and promptly had water-filled glasses. The menu was average for the area, but with the great reviews we saw online, we weren't too worried. A bowl of marinated cucumbers arrived (their standard give-away appetizer, we think), and they were okay. Honestly, they just gave us far too many of them, as it seemed we hardly made a dent (you can see the plate a little in one of the photos). Shortly after we ordered, another appetizer arrived. The server (who had an accent we couldn't place AT ALL... must've been Lithuanian or Siberian or something... some country where I don't know what the language sounds like, LoL) described it, but all we could make out was "carpaccio" and "on the house" so that was good enough. The sauce (ponzu-ish) was fabulous, and there were also scallions. The meat had the consistency of thinly sliced raw chicken, but it must've been some sort of fish, we ascertained. We figure it was probably a new dish they were trying out, since several other tables also received it, and we gave our opinions when the server came by again. 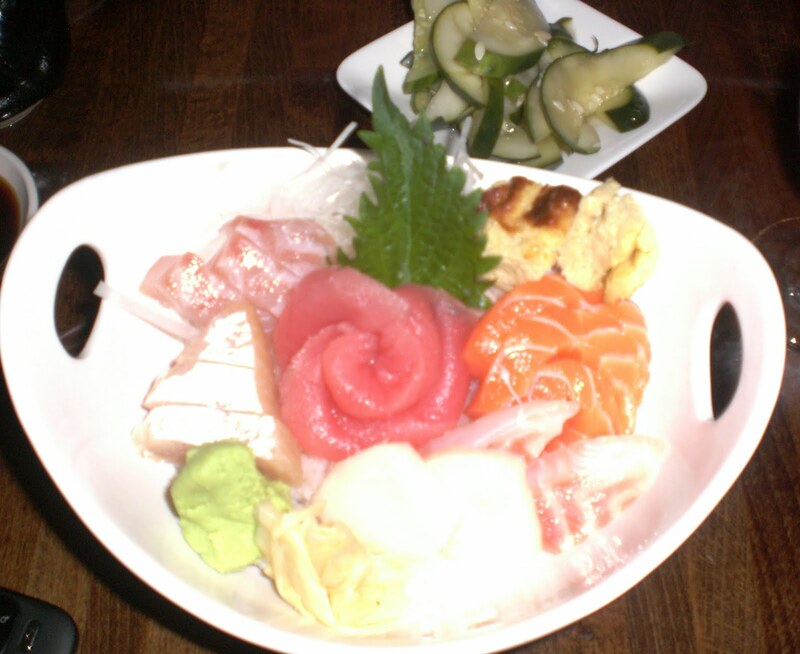 I ordered the chirashi, and was surprised when it came in a bowl (usually it's served in more of a box). The photo came out a little overexposed, but you get an idea of the fishes. The white tuna was phenomenal. As in, it might have been swimming in the ocean that morning, it was so fresh! The tuna and salmon were also very fresh. The striped bass was average, the squid was average (maybe a little above), and the sponge (the breadcrust-looking thing in the top right of the bowl). I forget what else might have been in there. The only problem was that I couldn't get to the rice forever since it's all underneath the fish, and because of the design of the bowl, whenever I ate a piece, that void was filled by the fish falling onto itself and closing up my rice access. Also, the julienne radish got in the way, since it was a little heavy on that as well. Jonathan ordered two rolls. The first was the JB roll, which is pretty standard for cream cheese and salmon (JB in this case stands for Japanese Bagel, if you didn't know). 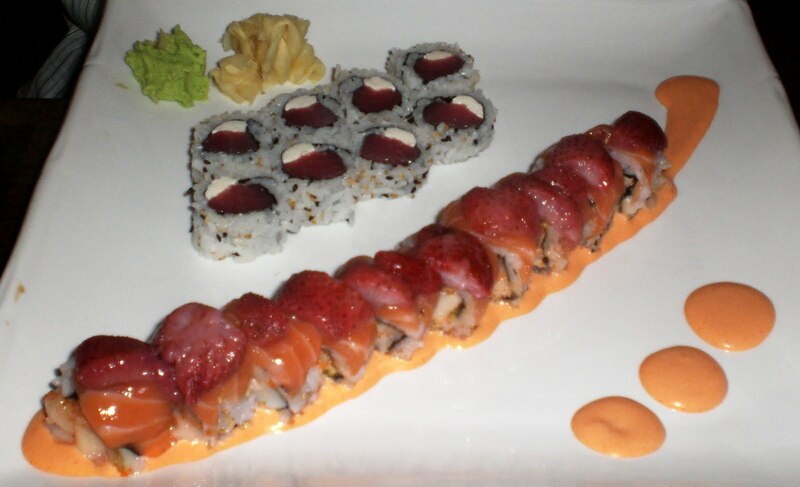 This roll, however, was tuna and salmon. Not sure if that's the way this place interprets that item, or if someone made a mistake somewhere. Either way, the cream cheese was a little overwhelming for the tuna, but it was okay. The second roll (the gargantuan roll in the picture) was that night's special. It had salmon, white tuna, and scallops, and was topped with strawberries. It also had a sauce that was quite different, not sure how to describe it other than spicy mayo-ish. The flavor combination was astounding. Very creative, and absolutely one-of-a-kind. I had never had strawberry in sushi before, but apparently fruit is a common thing for this restaurant, since there were several other items on the menu that included things like apples. Overall, the place is good, and worth taking out-of-towners to. It's BYOB (let's not forget about Pennsylvania and its interesting liquor laws), and they are very friendly. Stop by if you're down in that area.